Wild: The much larger ancestor of water birds like the stork or pelican, Pelagornis miocaenus shares many traits with its modern-day brethren. However, it seems to spend much more time hunting for fish over the open deep-sea. 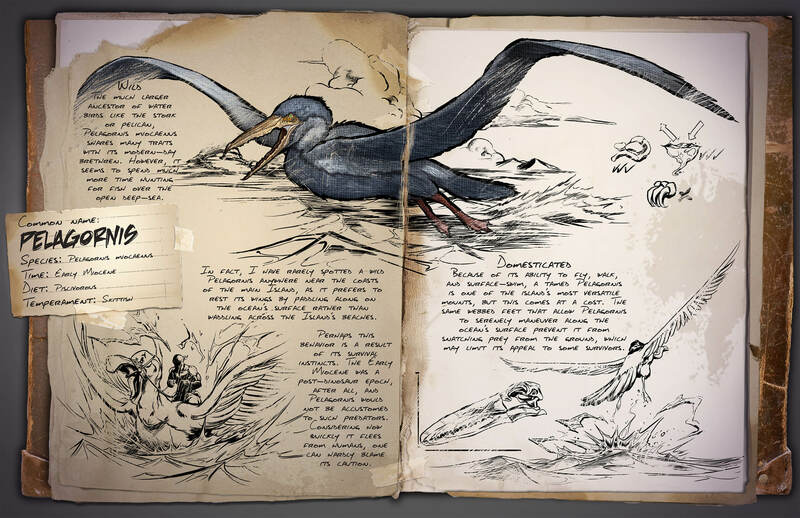 Domesticated: Because of its ability to fly, walk, and surface-swim, a tamed Pelagornis is one of the island’s most versatile mounts, but this comes at a cost. The same webbed feet that allow Pelagornis to serenely maneuver along the ocean’s surface prevent it from snatching prey from the ground, which may limit its appeal to some survivors. Known Information: In fact, I have rarely spotted a wild Pelagornis anywhere near the coasts of the main Island, as it prefers to rest its wings by paddling along on the ocean’s surface rather than waddling along the Island’s beaches. Perhaps this behavior is a result of its survival instincts. The early Miocene was a post-dinosaur epoch, after all, and Pelagornis would not be accustomed to such predators. Considering how quickly it flees from humans, one can hardly blame its caution. A new flyer! I’ve been waiting for a new one. I’m hoping this one will be quicker than the argent, but not be able to carry the same weight and fly for the same period of time. At the same time, it would be a bit slower than the pteranodon. Based on the patch notes, this one is going to be released on June 28th.